The heroes who saved a biker from beneath a burning car have described the moment they dropped their tools to leap to the aid of the trapped Utah college student, seen being rescued on video, here. 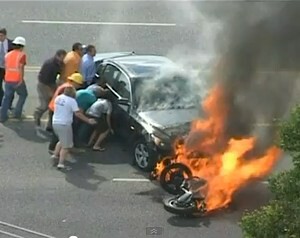 In a statement, the biker’s uncle said, “It just really restores your faith to have seen what happened yesterday. We are extremely thankful.